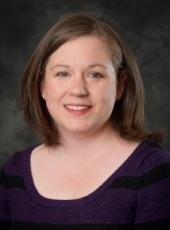 Amy Lark, Assistant Professor in Applied Science Education, was one of the Michigan Tech faculty members to receive an award exceeding $5,000 from the Michigan Space Grant Consortium for her program “Teacher Training: The Next Generation Science Standards in Theory and Practice”. Click here to see a full list of recipients. As an affiliate of the Michigan Consortium, Michigan Tech has been an active participant in MSGC for approximately 20 years. MSGC funding is administered through MTU’s Pavlis Honors College. For more information, contact Paige Hackney in the Pavlis Honors College, call 7-4371, or visit the MSGC website. 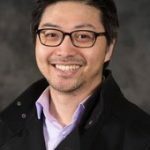 Myounghoon “Philart” Jeon (CLS/CS) and his colleague Paul Fishwick guest-edited a special issue on “Arts, Aesthetics and Performance in Telepresence” in the journal Presence: Teleoperators and Virtual Environments. Drs. 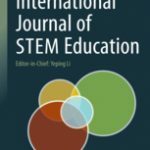 Dare and Ellis of the Teacher Education program in Cognitive and Learning Sciences have published new research in the International Journal of STEM Education. Along with their co-author, Dr. Gillian Roehrig at the University of Minnesota, Drs. 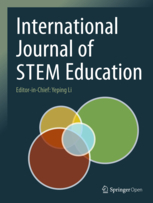 Dare and Ellis explore middle school teachers’ experiences in their first-time implementation of integrated STEM curriculum units. This article is publicly available through Open Access. 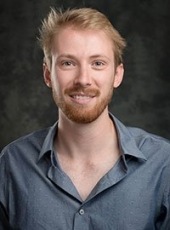 College of Sciences and Arts Dean Bruce Seely has chosen Joshua Ellis, assistant professor in the Department of Cognitive and Learning Sciences (CLS), as his second selection for the Spring 2018 Dean’s Teaching showcase. Seely agrees, and that is why he chose Ellis as this week’s Dean’s Teaching Showcase member. Ellis will be recognized at an end-of-term luncheon with 11 other showcase members, and is now eligible for one of three new teaching awards to be given by the William G. Jackson Center for Teaching and Learning this summer recognizing introductory or large class teaching, innovative or outside-the-classroom teaching methods, or work in curriculum and assessment. 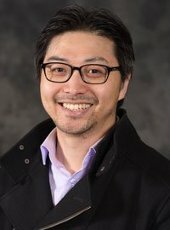 Myounghoon “Philart” Jeon (CLS/CS) and his collaborators recently published “Robotic Motion Learning Framework to Promote Social Engagement” in the journal Applied Sciences. Michigan Technological University’s transdisciplinary researchers reach across disciplines and institutional boundaries to solve complex problems that are bigger than a single specialized field. Kelly Steelman, an assistant professor of cognitive & learning sciences, says diversity is good for problem-solving. If you only have a spoon, the only food you’ll want to eat is soup. Read the full story on the Michigan Tech News Website. Elizabeth Veinott, Associate Professor in Cognitive and Learning Sciences, along with graduate student Katy Roose, recently presented their games for learning paper in the beautiful city of Amsterdam, Netherlands. The paper, Roller coaster park manager by day problem solver by night: Effect of video game play on problem solving, was included at the CHI-Play conference. The Department of Cognitive and Learning Sciences inducted seven new members into Psi Chi, the International Honor Society in Psychology: Glory Creed, Elizabeth Kelliher, Abigail Kuehne, Mariah Sherman, Kay Tislar, Samantha Verran, and Kira Warner. The induction ceremony took place at the Harold Meese Center on Sunday, December 3. The Michigan Tech Chapter of Psi Chi is led by Halie Hart (President) and Caden Sumner (Treasurer) and advised by Dr. Kelly Steelman. In Ceremonies held Oct. 21, Michigan Tech inducted three new members into the University’s Academy of Educators. 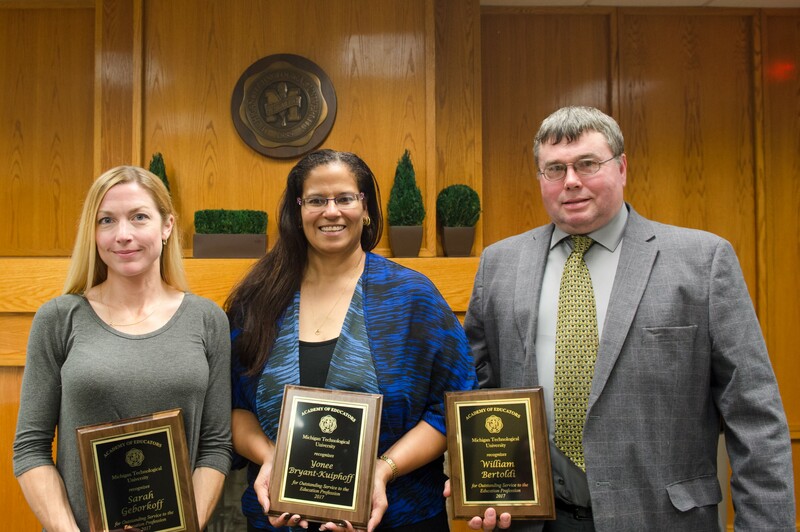 The inductees included William Bertoldi, Sarah Geborkoff and Yoneé Bryant-Kuiphoff. William Bertoldi graduated with a BS in Chemistry in 1980, with Secondary Teacher Certification in Chemistry and Mathematics. Bertoldi spent 30 years teaching in Kingsford Middle and High Schools. In 1996 he established a student organization called “Rockets for Schools,” for which he still serves as advisor. The group designs, builds and launches high-powered rockets. They have performed rocket launches at ceremonies nationally and have been featured in three commercials showcasing student work and have appeared on the Science Channel. Sarah Gerborkoff, a science teacher at Houghton Middle School, earned a BS in Geology in 2000 with Secondary Teacher Certification in Earth Science and Science. Since 2013 she has served at Houghton Middle School as the Lead Teacher for the Lake Superior Stewardship Initiative Project. On three different occasions, she served as the advisor for the Lexus Scholastic Eco Challenge team. Her 2014 team that focused on invasive species and her 2015 team that studies the remediation of stamp sands both won a $10,000 national prize. Yoneé Bryant-Kuiphoff began her career as a science teacher at Milwood Magnet School in Kalamazo in 1993. She eventually became lead science teacher and assisted with staffing and curriculum for the new magnet school. A 1986 graduate of Cornerstone University, she received a master’s in Applied Science Education from Michigan Tech in 2014. Since 2008 she has served as the Middle School Director for the Michigan Science Teachers Association. From 2011-14, as a member of the first cohort of the Michigan Teacher Excellence Project, Bryant-Kuiphoff participated in the collaboration of Michigan Tech and urban schools to improve Earth Science instructional practices. Shari Stockero, director of teacher education, in the Department of Cognitive and Learning Sciences says the newest inductees are certainly due the recognition. 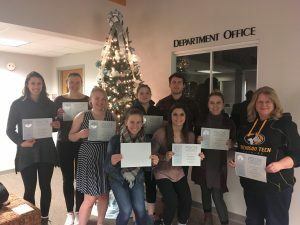 The Academy of Educators gives public recognition to Michigan Tech alumni and alumnae who have brought distinction to themselves, Michigan Tech and the Teachers Education program through their participation, commitment, outstanding leadership and/or public service in the field of K-12 education.